The Transcendental Meditation technique is taught in Lebanon by Maharishi Enlightement Centers, under the umbrella of the Middle East Foundation of the Science of Creative Intelligence, a non-profit educational organization registered in Lebanon. All revenues from course fees go entirely to support the organization’s educational and charitable initiatives in Lebanon and around the world. As a non-profit, the Foundation has no owners or shareholders. No board members or other individuals profit financially from the organization’s programs. Over the past five years, full TM scholarships have been given to more than 300,000 at-risk students and others in need through partnerships with other non-profit organizations and foundations. The Global Country of World Peace was founded by Maharishi Mahesh Yogi as a consortium of educational organizations in more than 100 countries working to create a new era of peace, progress and prosperity in our world family. The Global Country of World Peace is a “nation without borders” promoting unity consciousness and the reduction of the narrow nationalism that divides humanity from humanity. It is a home for peace-loving people everywhere. The domain of the Global Country of World Peace is CONSCIOUSNESS—the prime mover of life—the ground state of natural law, the field of all possibilities. The Global Country of World Peace is a non-political, non-religious global organization and does not usurp any of the functions of existing governments, nor does it replace them in any way. The Global Country of World Peace takes a parental role towards every government. It will support and nourish the ideal for which all governments are structured—the maintenance of well-being and progress throughout society. The sole purpose of the Global Country of World Peace is to enliven consciousness, the field of all possibilities, and to create a time for the world family that is free from struggle and suffering and in which every individual will be enlightened, spontaneously functioning in accordance with all the Laws of Nature. On this basis, people will not make mistakes in daily life and every level of government will enjoy Automation in Administration—problem-free administration for unlimited progress and achievement. 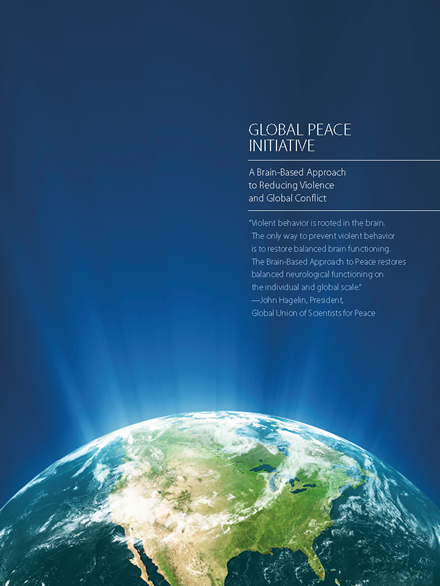 This is a comprehensive 31 page brochure called Global Peace Initiative: A Brain-Based Approach to Reducing Violence and Global Conflict. Conventional approaches to reducing violence and social conflict are costly and, ultimately, ineffective because they do not address the underlying cause: acute societal stress - including political, ethnic, and religious tensions in critical hotspots around the globe. Stress negatively impacts the brain, impairing reasoning and fueling impulsive, violent antisocial behavior. The Global Peace Initiative has identified powerful, scientifically proven meditation-based “technologies of consciousness” that neutralise individual and societal stress, restore balanced brain functioning, and markedly reduce crime and social conflict. Copyright © 2015 Maharishi Enlightenment Center. All Rights Reserved.